Combinez les singes, les marchés et des vues magnifiques lors de cette inoubliable excursion d'une journée à Ubud au départ de Denpasar. Observez les macaques gris en liberté au Sanctuaire de la forêt de singes sacrés d'Ubud ; parcourez les étals d'artisanat au marché d'Ubud ; puis émerveillez-vous devant les rizières en terrasses de Bali, inscrites sur la liste de l'UNESCO. 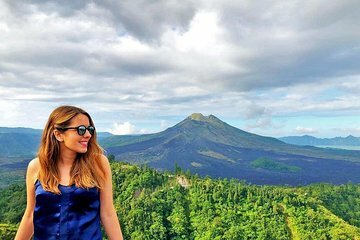 Ce n'est pas tout : un délicieux déjeuner buffet (inclus) à Kintamani, avec vue sur le Mont Batur et le lac Batur ; goûtez le Kopi Luwak dans une plantation de café locale et participez à une cérémonie traditionnelle au temple d'eau de Tirta Empul. This private day trip to Ubud offers a more intimate experience than the typical group sightseeing trip. Our guide and driver for the the day was Wayan B and he was absolutely fantastic the person i travelled with called him superb. He explained everything to us from hindu beliefs, temple etiquette and Bali road rules or lack of to haggling at the markets, and even made sure we got a table with a great view for lunch. He made our trip awesome and easy. The trip itself is great. Not only do you see what is listed but there is also so much to see as you travel from place to place. Definitely value for money and a great day that we would recommend to anyone looking for an introduction to Bali. Even though we arrived late due to tendering issues Wayan,our driver,was waiting. Cold towel and water as we got in the car. Delightful guide/driver who showed us as much as possible in the time we had. Friendly and accommodating. Very helpful and informative. Excellent lunch. We would recommend this trip and this guide to anyone. Our tour guide, Wayan Berata, was absolutely fantastic! Highly recommended! He picked up my mother and I from our hotel in Nusa Dua and our amazing journey began. Wayan's English was excellent and he didn't mind us asking a million questions every step of the way. We hit all of the places on our itinerary, plus had time for a couple of extra markets. In order, we went to: an art market, coffee plantation, the Ubud monkey forest, the rice terraces, Kintamani for lunch overlooking the Mt. Batur volcano, Tirta Empul and ended with a place where they make silver and gold jewelry. I still can't believe how much we were able to see in just one day! We felt completely safe with Wayan Berata and trusted him to be honest with us he even gave me some great tips for bargaining in the markets! and steer us in the right direction. There is no way that we would have been able to have seen and done so much without him! He was also such a gentleman and helped my mother up and down stairs as she has bad knees. He was so incredibly personable and after we were back home in the US, he has kept in touch and sent us some of the pictures he had taken using WhatsApp. We definitely have a new friend in Bali now! : Terima kasih banyak! Wayan, our guide was very good. He ensured we saw everything that was on the itinerary and was helpful finding items that were on our shopping list. He was punctual, the car was clean and comfortable and we really enjoyed our time with him. This was an exceptional tour, very much enjoyed this one. A private driver, ours was Wayan, kept a very good commentary throughout the day. Explained local customs, and fortunately this tour was broken up by regular stops, otherwise the drive from Jimbaran to the volcano area would have been unbearable. Visit to the coffee shop was interesting, to see what the locals do with coffee and tea. The temple was also good with Wayan taking the time to explain the local customs with regard to religion as well as explaining the various areas of the temple. The monkey forest had potential to be painful, but fortunately others were taking the pain by touching the monkeys. Keep away from them, they tend not to bother you. Very much a humid experience due to overnight rain, but enjoyable nonetheless. Well worth it, especially if you get a good driver, with excellent English. We followed the given itinerary only loosely, and our guide Rusmun proved both flexible and quick-thinking. He got us to all of our personal destinations such as a shop in Ubud owned by an old friend of ours and worked-in many of the standard destinations including a beautiful rice terrace as the route permitted. His savvy use of Waze kept us on track and out of traffic as much as possible. Beyond being a great driver, Rusmun is a knowledgeable guide and highly proficient English speaker and was able to answer nearly all of our questions. Great trip...but beware the crowds Tirta Empul and Ubud Monkey Forest. As we were based in Nusa Dua, this trip was a long day in the car for myself and my husband, but it was a great introduction to Balinese culture and our guide was GREAT. 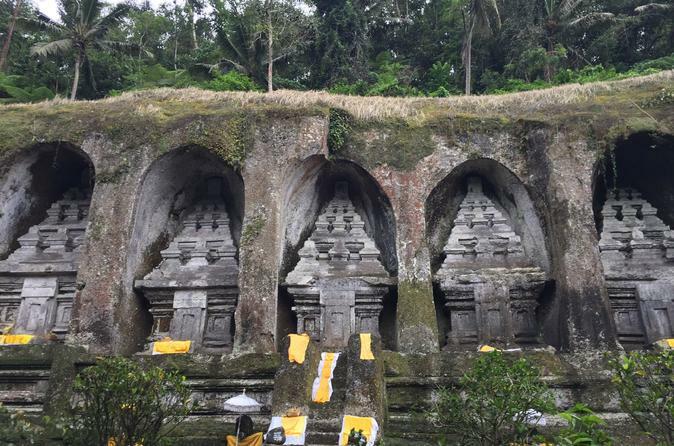 We began the day with a drive to Ubud, where we visited the Monkey Temple. It was a bit wet that day, so our guide told us that the site wasn't nearly as crowded as he had seen it in the past - and we were STILL tripping over a ton of tourists. Just so you are warned in advance. That said, the Temple itself is really beautiful, as is the forest itself - to me, the monkeys are a fun feature, not the highlight - but then again, there weren't a ton of them around as it was raining a bit, and I myself was more interested in the cultural aspects of the site. After the conclusion of our visit, we headed upslope of the volcano and had lunch with a vista of the Batur valley. The view as impressive the aggressive touts and poor quality of the lunch at the touristy restaurant, not so much. After lunch, we wound our way back down the volcano, and visited a coffee/fruit farm, sampling the infamous Luwak coffee and tea selections. The teas were surprisingly quite tasty, and their variety proved rather fascinating to a couple of American tourists from the desert think, Lemongrass, Tumeric, and Passionfruit varieties. The Luwak coffee failed to really impress, given its reputation as the best coffee in the world, but it's worth a try when in Rome, right? !, and seeing some exotic varietals in their natural state cacao beans, mangoes, melons and snakefruit was certainly worth the trip. After we finished our cat-poo-chino, our guide shepherded us to Tirta Empul. A beautiful site, it's sense of holy ritual is somewhat lost in the crush of tourists and their omnipresent cell phones admittedly, I'm as guilty as the rest there. Our guide told us that we may have experienced a bit more of the crowd as a result of the full moon however, most of the crowd was not there to worship, so I suspect that's just something you'll need to expect when visiting. With that said, the holy pool is rather fascinating as you can see the springs bubbling up from their deep volcanic source, and the fountain complex is really beautiful. This is undoubtedly a tourist trap, however be aware that you will literally have to navigate yourself out of a maze of hawkers selling trinkets at the exit - the line of stalls just goes on and on and some of the vendors can be quite aggressive, which can be off-putting, particularly if you're expecting a more serene experience. Our guide was so intuitive or maybe not, I don't have the best poker face, despite living in LV, that I think he realized we were a bit disappointed by the crowds and wanted a more authentic experience, so bless his heart, he took us to Gunung Kawi to finish our day. Absolutely stunning, our stop at Gunung Kawi really made this trip absolutely worthwhile. While it is a steep, and rather long, hike down, we were charmed to have a group of Balinese musicians accompany us with a full set of gamelon down the steps! The shrines remain in a pretty great shape despite their age, and the temples and bridges surrounding them are just lovely. At last, we felt like we were able to see a bit more into the lives of the real Balinese people - women carrying offerings of fruit on their head as they navigated the steps a couple receiving a blessing from a priest at the base of the temple a village preparing for their full moon festivities in the social halls at the base. It was a great experience, completely worth the rather strenuous trip up and down the steps note: my husband and I are in relatively good shape and were able to complete the hike without getting too out of breath, but I would not recommend this path to anyone with physical limitations. The vendors at the top were aggressive, but those at the bottom were quite nice, and the bone carvings they offered were like nothing else I saw the rest of the trip - I'm still kicking myself for not picking up a souvenir here. All in, a great, if long, day and a wonderful introduction to Balinese temples and culture and tourism. Our tour was fantastic! Our guide was very knowledgeable and was easy to get along with. Very comfortable in the air conditioned vehicle. Highly recommended!